All over the World and in India as well in 2011 we witnessed the uprisings to protest against injustice. In Arab world it has been against tyrannical dictatorial regimes to bring back democracy. In the US and many other European countries where ‘Occupy Wall Street’ has been the major one, the people are protesting against the socio-economic disparities which are due to the present system of economic structure. 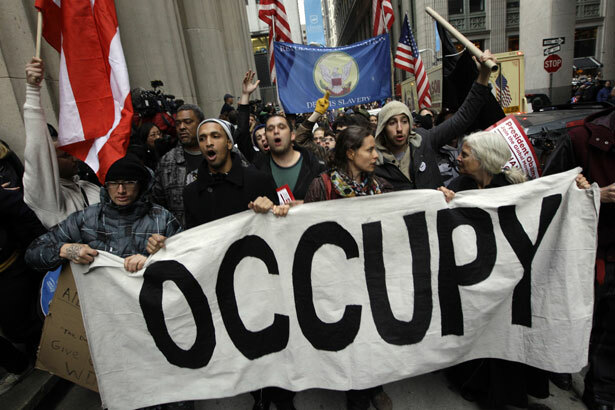 The Occupy Wall street movement is very profound in the sense that it brings to our attention the basics of the system, indicating about the deeper malaise in the system. In this movement most sections of people are participating (We are 99%). In India also this year was a very significant as people rose to protest against multiple issues. The usurpation of peasants’ land for so called development has been the major issue and it manifested itself through agitations like the one against POSCO, in Orissa. The other upsurges combined the concern for ecological preservation and protest against the nuclear hazards as in Koodankulam and Jaitapur. Currently there is a great amount of land alienation for large number of people. The protests in this direction has been significant but under projected by media. Similarly the long standing protest-fast of Irom Sharmila for repeal of Armed Forces Act brings to our notice the atrocities committed by army in places like North east in particular while Kashmir has also seen similar problem. What came as an overwhelming upsurge was the one led by Anna Hazare. Here combination of several factors played their roles and made it spread far and wide. In this movement IT-MBA generation and some other sections constituted the core support base of movement. There was also a parallel phenomenon of movement against black money by Baba Ramdev. Anna Hazares’ main insistence was to bring in Jan Lok Bill drafted by his team, but it appeared as if it is against corruption and that those who are not supporting his bill are for supporting corruption. His movement has been supported by various elements including the religious gurus like Sri Sri Ravishanker. The major mobilization for this was done by Corporate controlled media and the RSS. The overall scenario is that people are suffering the economic injustices, social inequalities and political marginalization. This Anna upsurge is focused against corruption alone, it does talk about corruption being the major cause of peoples’ suffering, but at the same time it underplays and bypasses the deeper issues which result in corruption. The corruption is very much there, but it is a symptom of the deeper disparities at economic and social level. Corruption is there due to the power centralization and lack of transparency in the system. Anna movement is in contrast to Occupy Wall Street Movement. Anna movement focuses. or rather hyper focuses, on the symptom of corruption with the result that the deeper inequalities of system remain unseen. All social movements have a complex dynamics. While people have genuine aspiration to bring to fore their real issues, many of the movements remain trapped at the symptomatic level and this tantamount to bypassing the core issues. Anna movement is a case in point. Here while Team Anna has brought to our attention one issue of our society, it has at the same time undermined many other issues and tried to denigrate the parliamentary system. It has deliberately focused on corruption of one political party alone. It has twisted every argument to talk against one party, there-by playing the role of electoral trumpet for the other major political party, which happens to be the political child of RSS, the major mobilize of Anna movement. It seems as if it has a contractual obligation to promote the BJP. At the same time those who bring this observation to the notice of society are deliberately branded as stooges of ruling Congress, which anyway has done enough mistakes to let Anna movement assume the present dimensions. The Arab uprisings are trying to bring democracy-parliamentary system; Anna movement in contrast is trying to create a parallel oligarchy, presenting Anna himself as being above parliament. This Anna movement has put all sorts of pressures to denigrate the parliamentary system and the elected representatives of the people. While one feels that mass movements, social upsurge, are the key to change and are welcome, all upsurges do not necessarily lead to social betterment. One recalls the Ram Temple movement which unleashed the era of violence and marginalization of minorities in the country. This one, Ram Temple movement, focused on identity issue. Anna movement focuses on symptomatic issue. What is common in the identity issue and symptomatic issue is that both bypass the deeper social issues of inequalities and the issues related to rights of marginalized. The issue of Ram Temple was not the issue of marginalized sections though many of them were roped in by social engineering. Similarly the dalits and minorities kept aloof from Anna movement as they know it is trampling upon their deeper concerns. Anna movement has been highly projected and made most visible, while the ones' around POSCO, Jaitapur and Koodankulam have been underplayed and Irom Sharmila has been mostly ignored. The issues involved in these protests are very crucial to our marginalized sections of society, also these issues are neither merely related to identity neither are they just the symptomatic one’s. That’s one of the reasons as to why corporate controlled media underplays them. These movements affect the life of society, in a deeper sense. That should explain that those for upholding status quo in society will highlight and go ga ga about anti corruption movement which has been presented as a spectacle. At the same time the other movements have been practically underplayed as they question the deeper issues related to the system and question the status quo. All said and done, the mass upsurge being experienced here is a sign of maturing democracy, despite vested interests trying to deflect the movement in authoritarian direction. Surely change for better should be the norm and social movements questioning the system are the engine of social change. Unlike Anna movement these movements base themselves on the democratic principles and are inclusive in their approach. All protests in India should have awakened our conscience but unfortunately, only one of these, the Anna movement, has been given primacy. We need to do course correction and give due importance to other protests also, which is their due.